The 130th station is indicated as "Future Station 2031"
Residents will remember the tussle over the location of the Sound Transit station at NE 145th, now called the Shoreline Sound station. Councilmembers in Seattle were lobbying for the station to be located at NE 130th St. The decision was to locate the station in Shoreline and promise a future station in Seattle at 130th. It appears that the future is getting closer. 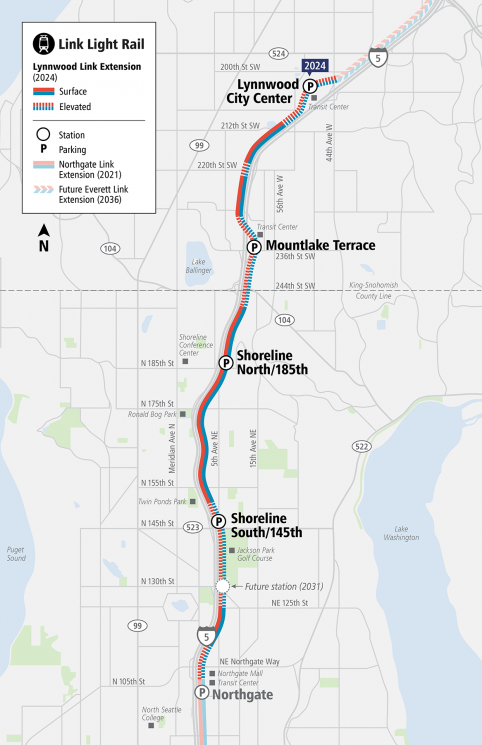 At its September 27 meeting, the Sound Transit Board decided to advance the NE 130th Street Station into preliminary engineering (PE). Originally scheduled to open in 2031 as an infill station along the Lynnwood Link Extension alignment, the Board directed staff to advance to PE to determine if the station can be sufficiently built by 2024 when LLE goes into revenue service. Building earlier could potentially save construction costs and avoid later service disruptions associated with constructing it as an infill station. Staff and consultants will take the next year to complete the PE work resulting in greater details on the benefits and downsides of project acceleration and understand the impacts to Sound Transit’s financial and staff resources. This information will be brought back to the Board to make a final decision on whether or not to accelerate construction. Good... now cancel one of the Shoreline stations!